Now fast, high-quality colour printing can be an affordable everyday reality for small busy workgroups. The revolutionary new GelSprinter GX 3050N technology features a combination of innovations enabling networked users to boost productivity by printing professional-looking colour documents on demand. 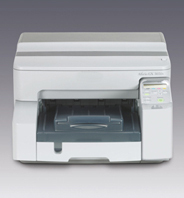 Extra wide print head and precise paper handling ensures high-quality print.